Waiting four years to release a follow up to an album is a brave move, especially for a band like The Xcerts who, although they have made a name for themselves in the rock world, they’ve not quite had the same effect in the pop world – so to speak. The Xcerts have always been bubbling away and preparing themselves for big things and There Is Only You proves that these guys deserve the monumental break that they’ve worked so hard towards. There Is Only You is one of those albums where you just know it’s going to be huge; it’s pure, mind-melting rock that doesn’t stop for anyone. The first track on the album, ‘2.12.12’, is questionable. It is two minutes of relaxing piano music that’s reminiscent of the beginning of a painfully predictable romantic film, which is quite apt considering Murray Macleod (singer and guitarist) explains that the album is based on the torment of love. ‘2.12.12’ leads you down a path where you expect the album to be infused with interludes and slow, agonisingly painful songs but when listening to the album, it’s quite clear that it is the exact opposite. It’s full on rock music from start to finish. Thrusting into the second track ‘Live Like This’, you’re reminded what The Xcerts are all about; good rock music. ‘Live Like This’ adds a burst of flavour to the album which lingers throughout. The first single released from There Is Only You, ‘Shaking In The Water’ follows the triumphant opening of the album and adds a slightly more poppy element to the album. With the laid back “ooooooooooh’s” and Murray Macleod’s gorgeous vocals, it’s difficult not to fall in love with The Xcerts. ‘Kick It’ is easily one of the best songs on the album. The song is full of angst and pent up anger that is gasping to be released through beefy riffs and hooks. ‘I Don’t Care’ and ‘Kevin Costner’ provide opportunities to escape the hard and hammering rock music but they still contain the same amount of energy and power as the rest of the tracks on the album. After all, do you really want to escape such a jaw-droppingly good riff-fest? ‘Teenage Lust’ kicks in and it’s a reminder of the full-frontal, full steam ahead rock music that The Xcerts are so capable of making. Up next is ‘Pop Song’ and it does what it says on the tin. It’s a pop song (of sorts) with some epic guitars, drums and a sneaky little bit of piano. 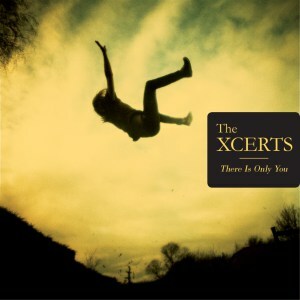 Admittedly, the piano bit kind of reminds me of ABBA but somehow, The Xcerts have made it work impeccably well. It’s a track that’s sure to launch The Xcerts into the success they truly deserve when it's released as a single 01.12.14. The Xcerts manage to build excitement into all of the tracks on the album whilst pouring in a huge amount of fire and soul. There Is Only You has so much love and emotion intertwined into the album that it can easily be mistaken for anger and hurt through the way in which it’s construed with heavy rock music; but in no way can you make this mistake when listening to the title track of the album. The change from the heavy rock to the sweet piano music at the beginning of ‘There Is Only You’ and the swift change again to the hammering rock music the listeners have become so acquainted with is what makes this track in particular, so special. The lyrics are captivating and so heart-warming that it really makes you stop and think about the album as whole. There Is Only You takes you on a journey of love and heartache, to the depths of beyond and brings you right back down to earth again. It gives you the opportunity to escape the mundane life of an ordinary person and explore a world of endless possibilities. As cliché and incredibly romantic as that sounds; The Xcerts have created a modern rock masterpiece which everyone needs to get their teeth in to.